BlindGossip – This actor has many successful films to his credit. Since his last couple of films didn’t do so well at the box office, though, he is having a bout of insecurity. He has recently consulted with at least three different plastic surgeons about having his face freshened up. He doesn’t want a nose job or cheek implants or botox. He just wants to look like a younger version of himself. 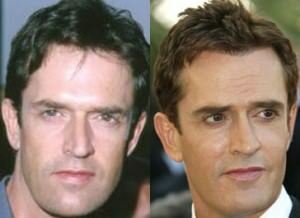 More specifically, he gave each surgeon the following guideline: He doesn’t want to look like Rupert Everett. We are assuming he means that he doesn’t want to look overdone. Then again, he would also probably never accept a role as the gay best friend of Julia Roberts in any film.